A potential storyline that has developed in recent times in the sport of Boxing has been one involving three fighters who may indeed face each other in the near future. Saul Alvarez, Gennady Golovkin, and Miguel Cotto. Following his victory over James Kirkland on May 9th, Alvarez expressed interest in moving up in weight from the 154lb. Jr. Middleweight division to the 160lb. Middleweight division to face either current WBC world champion Cotto or current unified WBA/IBO world champion Golovkin. 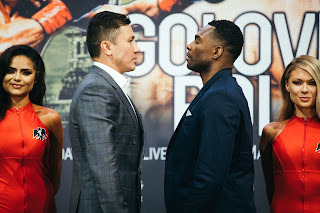 Golovkin meanwhile stated following his title defense over Willie Monroe Jr. on May 16th that he wants further unification in the Middleweight division. This would theoretically open the possibility of a unification bout with Miguel Cotto at some point in the near future. With both Alvarez and Golovkin successful in their recent bouts the stage is now set for Cotto to make the first defense of his WBC world championship against former two-time Middleweight world champion Daniel Geale on Saturday, June 6th at the Barclays Center in Brooklyn, New York. In his last fight Cotto scored a tenth round stoppage of WBC Middleweight world champion Sergio Martinez in what was a dominating performance. Now almost exactly one year later Cotto prepares to defend that title in what will be his second fight in the Middleweight division. The four-division world champion Cotto will face what could be a difficult opponent in the form of Daniel Geale. Geale, the former two-time Middleweight world champion has been one of the top fighters in the division for several years having defeated fighters such as Anthony Mundine, Sebastian Sylvester, and Felix Sturm among others. Geale however, suffered the first knockout loss of his career in July of last year when he was stopped in three rounds by Gennady Golovkin. Geale hit Golovkin with a flush right hand to the head, but was dropped by Golovkin’s own right hand after absorbing Geale’s punch. Geale was able to beat the count, but was unable to continue. Geale was able to bounce back from his defeat at the hands of Golovkin by scoring a twelve round unanimous decision over Jerrod Fletcher in December of last year. Although Geale was stopped by Golovkin, he is a world-class boxer who is known for his ability to throw his punches in volume as well as his solid lateral movement. In his bout against Golovkin, Geale was able to have some success in the opening round in being able to disrupt Golovkin’s rhythm. He was unable however, to maintain distance between himself and Golovkin and could not land anything to discourage him from pressing forward. There may be some who may believe that Geale’s fight against Cotto could have a similar outcome due to Cotto’s ability to apply consistent pressure and gradually break down his opponents. The key to this fight in my eyes will be whether Geale can establish himself as an elusive target and negate Cotto’s pressure and ability to land power punches. Although Cotto is a boxer/puncher and capable of adjusting his fight plan as a fight progresses, I believe that he will look to apply pressure on Geale from the outset, look to neutralize Geale’s movement and gradually break him down. If Cotto is intent on pressuring Geale from the opening bell, he must not let up as the fight progresses. If this fight has close rounds where both fighters are able to be effective, Geale is the kind of fighter that is capable of winning close rounds if he can get his punches off first and use his elusiveness to evade his opponent. If Cotto can negate Geale’s movement however, the advantage will be in his favor. Cotto does have an advantage in terms of punching power as he has compiled a near 75% career knockout percentage in forty-three professional fights, scoring thirty-two knockouts in thirty-nine career wins as compared to Geale’s 47% having scored sixteen knockouts in thirty-one career wins, in thirty-four professional fights. Although Cotto was able to dominate Sergio Martinez and scored four knockdowns in that fight, it will be interesting to see if Cotto’s punching power remains consistent as a Middleweight as compared to when he was fighting as a Jr. Welterweight, Welterweight, and Jr. Middleweight. It will be of equal interest to see whether or not Cotto will look to make a statement in this fight in facing a fighter that Gennady Golovkin was able to stop in three rounds. Per Cotto’s victory over Martinez, a fighter widely considered at the time to be the number one fighter in the Middleweight division and Gennady Golovkin’s fourteen successful defenses of his unified world championship and his knockout streak, which currently stands at twenty, there is little doubt that Cotto and Golovkin are the two top fighters in the division. Golovkin however, could be considered the number one fighter in the division in the opinion of some due to the length of his title reign as well as his current knockout streak. If Cotto is looking to defeat Geale in an even more decisive manner than Golovkin was able to do and is too intent on looking for a knockout and lets Geale establish an offensive rhythm by throwing punches in volume and allows Geale to win what could be considered close rounds, Geale is capable of pulling off an upset. Geale was able to defeat former longtime Middleweight world champion Felix Sturm in 2012 in a fight that some considered an upset. Geale finds himself once again in the role of underdog in this fight as he was against Sturm and against Golovkin. With potential fights against Saul Alvarez and Gennady Golovkin possibly awaiting the champion Cotto should he win this fight, we will see if he can do what Alvarez and Golovkin were able to do in their recent bouts defeat a determined opponent that stands across the ring from him. We will see what happens when Cotto and Geale square off on Saturday night.